AMES, Iowa — When Iowa farmers believe the benefits of planting cover crops outweigh the risks, they’re more likely to adopt this practice, new Iowa State University research shows. Iowa State researchers analyzed data from the Iowa Farm and Rural Life Poll and conducted in-depth interviews with Iowa farmers to examine the factors that determine whether farmers adopt the use of cover crops. Their research recently was published in the Journal of Soil and Water Conservation. The study evaluated the roles of several factors in farmers’ decision-making, including farmers’ perceptions about the characteristics of cover crop practices, their perspectives on potential barriers and facilitating factors and crop and livestock diversity on their farms. “As expected, farmers who believed that cover crops have important agronomic and environmental benefits were more likely to use cover crops. Farmers who had more diverse farm operations, particularly those who reported having livestock, also were more likely to have adopted cover crops,” said J. Arbuckle, an ISU Extension and Outreach sociologist and co-director of the Iowa Farm and Rural Life Poll. In-depth interviews with farmers across the state helped to shed light on both their motivations for cover crop adoption and barriers to their use, said Gabrielle E. Roesch-McNally, a graduate student in the Department of Sociology who worked with Arbuckle on the study and co-authored the journal article with him. 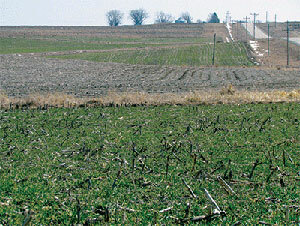 A number of farmers stated that they had turned to cover crops after major erosion events convinced them that they had to take action to combat erosion. Other farmers cited the “soil health” benefits of cover crops, relating that their primary motivation for cover crop use was to build organic matter and other indicators of healthy soils, Roesch-McNally noted. “Our in-depth interviews with farmers showed that perceptions of soil health and erosion control benefits are strong drivers for cover crop adoption. Further efforts to measure these benefits will be helpful for farmers who are making cost-benefit assessments of whether or not to use cover crops on their farm,” Roesch-McNally said. “Our results also suggest that farmers would be more likely to adopt cover crops if there were more technical assistance and other support available, for example if private sector agricultural advisers had greater capacity to provide cover crops-related information and services,” Arbuckle said. Organizations and agencies that promote cover crop use and adoption can help farmers understand the potential risks of cover crop use, such as yield loss or failed establishment due to weather, Arbuckle said. “A lot of emphasis is rightly placed on the benefits of cover crops, but the study results indicate that helping farmers learn how to manage and minimize potential risks might lead to more adoption,” Arbuckle said.